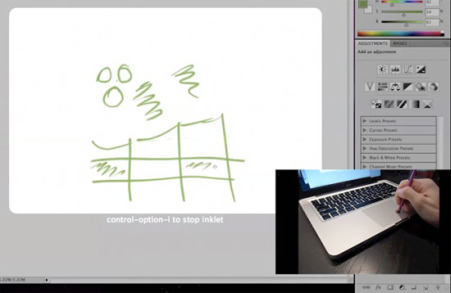 Inklet allows your trackpad to emulate a pen tablet. When you’re using a Pogo Sketch, a stylus for your iPhone ($14.95), the trackpad even becomes pressure sensitive. It works with the handwriting recognition built into OS X and includes an advanced algorithm to detect unwanted trackpad touches. In terms of compatibility, Inklet will function on newer MacBooks that have multitouch enabled and are running OSX 10.6 Snow Leopard. At $24.95, it’s a fraction of the price of hardware tablets such as the Wacom tablet. Marvelous right? Right. Except, it doesn’t seem to work with anything unless you’ve got Photoshop installed. :/ It reportedly uses Photoshop to let you scribble the note down and then the text is copied over to the software needed. Would be great to see this work with natively with Evernote for example. Nevertheless, impressive. Now watch the video.